Are you finding more and more frequently that you’re receiving blank stares or questions such as, “What?” and, “Can you please repeat that?” from a senior loved one with a hearing disability? It might not just be that his or her hearing loss is getting worse; the problem could actually be a result of your communication and pronunciation. Remember, for those with low hearing, a variety of factors such as background noise, mumbling, and the pitch of someone’s voice can make it all the more difficult to catch information and respond. 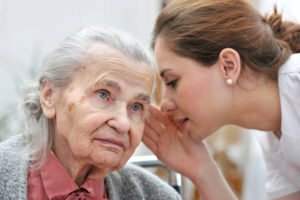 At Hired Hands Homecare, we work with elderly clients who have trouble hearing, and have a few tips for you to better communicate with your loved ones. If implementing these ideas still results in an increase in communication difficulties, it’s a good idea to schedule an appointment with your senior loved one’s physician to determine if another course of action is available to help. An adjustment to the senior’s hearing aid may be required, or there may be other options such as surgery to consider to improve his or her hearing quality. For more communication tips and other resources on helping older loved ones with a hearing disability to thrive at home, contact the Tri-Valley home care experts at Hired Hands Homecare. We offer professional, personalized in-home care for individuals who suffer from hearing loss and any other conditions of aging, as well as advice and guidance for friends and family who serve as their caregivers. With services available throughout Marin, Sonoma, Napa counties and the Tri-Valley, you can reach us any time at (866) 940-4343 to learn more.